Mini Black Night Watchman | BUDK.com - Knives & Swords At The Lowest Prices! This Mini Black Night Watchman provides discreet but effective personal defense. I bought several as gifts and now even bought one for myself. Well worth it and does not cost much at all. Excellent little product - Great price & highly functional for social work applications. Not super sharp, but it's more of a sticker' and could be sharpened if needed. Very good handle and blade is solid. I am concerned about my wife and daughters safety so I got one for each of them as a stocking stuffer. I looked so well made that I got one for myself and my son. When I received them I was not disappointed. It was all they said it was. This is well made and on my key ring now. Turns my keys into a great defense weapon. I am ordering more for gifts! Try it! Very solid construction, I just love hidden weapons everyone carries keys so why not add one to your set. You never know when you could need this! Good product, only the blade came a little bent. Fully functional otherwise. I received my order last week, and I initially posted a review for only three stars. The product looked slightly different than it did in the posted picture, with a small circle protruding from the end of the kubaton with threads around it that you would use to screw in the knife when opened. I wrote that (in the picture) the end appeared flat, and that it was not what the product really looked like. I mentioned that it was still a good product for the money, but overall it wasnâ€™t a very flattering review. Within hours of posting that review, I received a call from Trueswords apologizing for any confusion that the picture caused, and offering a refund or product exchange to make sure I was a happy customer. After that call, an email, and more thoughts on the product, I tried to go in and edit my previous review, but it didnâ€™t let me, so I emailed Trueswords asking them to take the my previous review down so I could post a new one. The issue I had that caused the three star review was more that I felt the picture was confusing than the actual product, and I shouldnâ€™t have let that impact my rating for the product itself, which is pretty great, especially for the price. Trueswords apologized for the picture being misleading, have since corrected it (within two days of my review, by the way, which is amazing), so I have no issue! The product itself gets five stars, but the superb customer service is why I wanted to post another review. I wasnâ€™t expecting my first review to even be read by them, let alone have them make such an effort to make sure I had a good experience with them. They get lots of kudos for their super-awesome customer service and dedication. This has been my second order with them, and it will NOT be the last. Just got it in the mail! 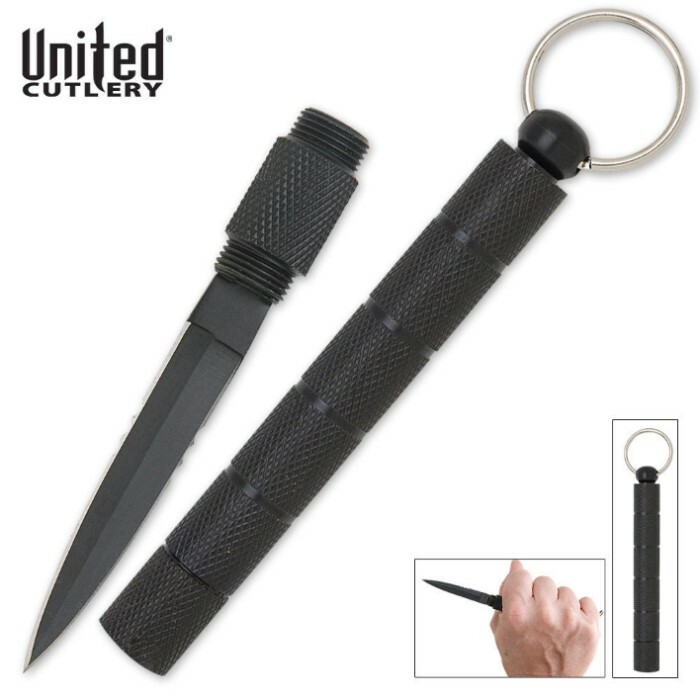 I just bought this because it was a cheap way to always have some kind of self defense on me at all times. The blade isn't sharp at all. It does have a very nice point on it though. Overall if you just want something to keep on your keys so you always have a little bit of self defense then this is perfect for you. Great protection for women! I'm am so so happy and surprised at the quality of my product!! Girls it's a key chain must!!! !